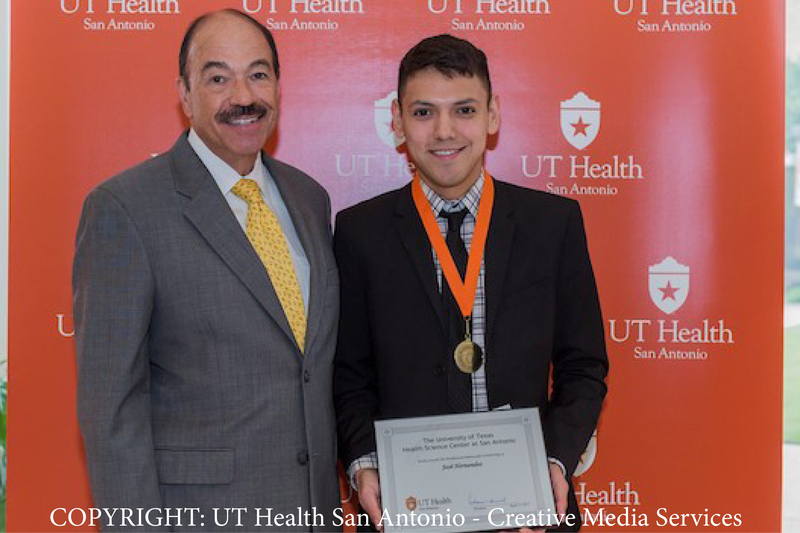 As an undergraduate, Joey Hernandez double-majored in psychology and mass communication and continually thought about an occupational therapy (OT) career. “Occupational therapy was always on my radar, even since I was younger,” recalled Hernandez. He worked for three years, first as a behavioral therapist and then in early child interventionist, while taking classes to prepare for graduate school. It was during his time in early child intervention that Hernandez observed occupational therapists at work. “I got to see first-hand what they did,” he said. His decision made, Hernandez applied to and enrolled in the occupational therapy master’s program at UT Health San Antonio. His choice was recently affirmed, as Hernandez, a first-year MOT student, received a Presidential Ambassador Scholarship. One scholar was chosen from each of the five schools and each received a medal, certificate and a $2,000 scholarship at the April 13 award ceremony. Hernandez, who will graduate in December 2018, is looking forward to learning more about different settings as he continues clinical rotations. Bridgette Piernik-Yoder, Ph.D., OTR, associate professor and Interim Chair of the Department of Occupational Therapy, nominated Hernandez, noting his strong academic record and robust volunteer efforts, as well as his demonstrated ability to represent the university to prospective students.